For those not familiar with the platform, Slack (and the Microsoft-alternative, Teams) is a group collaboration platform that enables team-wide discussion, individual and group chat, voice communication, and multi-media information exchange in a social media-like setting. The benefit of Slack communication is that discussion may be grouped into “channels” representing topics, interests or projects, a vital feature managing overwhelm in the information age. Entire documents may be dragged and dropped into this environment, providing both immediate and searchable access to information. However, because Slack is a web-based chat/forum environment, many persons in and supporting government industry shy away from the application of social collaboration – the question of security and information sensitivity is deeply ingrained. Recently unveiled, the MS Teams option offers a Slack-like alternative safely behind Office 365 or organizational firewalls. Likewise, Trello is an interesting planning capability based on the Kanban software-planning methodology that uses “boards” to house “tasks”. These tasks can be assigned to persons and due dates, categorized by colour and name, and also change states by moving from one to another board. These boards can be constructed in infinite ways, which can offer paradigm-changing perspectives of a project, team or individual’s objectives. Within the sphere of user-trending intranet collaboration, integration between Slack and Trello is highly coveted. Amazingly and excitingly, Microsoft accomplishes this much-coveted integration in Teams, making Planner a very flexible and responsive tool for organization-wide planning at varying scopes. In this article, we will explore the application of Microsoft’s collaboration tools from the context of project management, address the primary and potential benefits of these tools and their interactions from the user’s perspective. Unfortunately for our reader, who must endure this brief tangent, we cannot begin a discussion on the functions of Microsoft Teams without first beginning with an overview of Outlook Groups – Teams is an extension of Groups, though with some significant differences. Since 2014, Groups has emerged with increasing capability supporting teamwork collaboration. 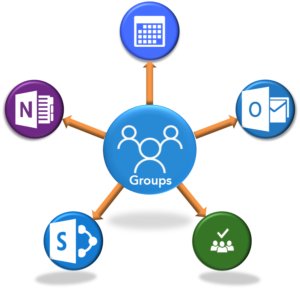 Currently, more than 85-million people use Groups every day; it is easily accessible through the user’s O365 account, allowing the user to access quickly their documents uploaded in the SharePoint library. Within Groups, each group is given one shared calendar, notebook, document library, and planner board to manage. Both calendar updates and conversations updated within a group send an e-mail to everybody in a group, keeping all members on the same page. By default, any user in the company can make a group. However, O365 admins maintain controls to restrict users or user groups from at-whim group generation. Additionally, administrators can now create and ‘customize’ data classification system for Groups – i.e. top secret, classified, unclassified or confidential, etc. The owners can also create permissions in the directory so that a group may be hidden from specific users or user-levels, and only the owner may add external guests. Additionally, administrators can restore a deleted group within 30-day period, as well as set a policy that automatically deletes them after a specific period. Released in early 2017, Microsoft’s Teams is uniquely formulated for teamwork and collaboration – it takes the existing Groups functionalities, and offers some interesting enhancements. In its current beta state, a user may have up to 250 teams at once, and any team can have up to 999 people in it. As with Groups, O365 administrators maintain full control over who can and who cannot create a Team, and individual members cannot view all enterprise users as contacts, just the members in their teams.. Each team-member is invited through an e-mail by an owner. Currently, however, Teams does not support external users (although this capability remains uncompromised on the Groups side of Teams). 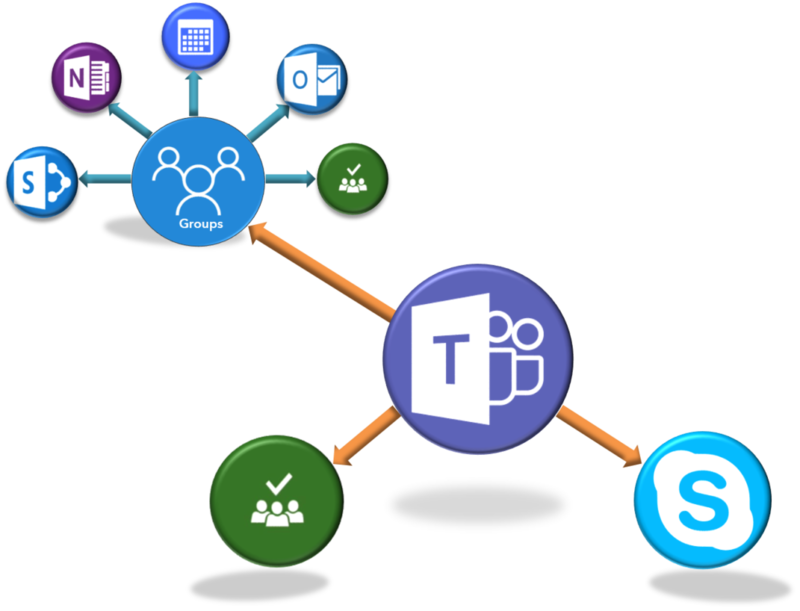 Teams comes with built-in access to SharePoint, Skype, Planner, and OneNote. Unlike Groups, Teams is chat-based application, where a “conversation” means just that. It’s integration with Skype enables users to engage in a more “messenger” style of dialogue among members – without the mass e-mails. In Teams, the Activity Feed assimilates all of a user’s teaming activities and member interactions from across all teams, into one consolidated view. From this feed, notifications tailored to each user keep the team on track.. Additionally, and potentially powerfully, Teams has integrated within its chat one of two prototyped Microsoft bots. Similar in function to “SlackBot”, T-bot can answer a user’s questions in a 1:1 conversation with it, as well as interact with the team’s conversation. 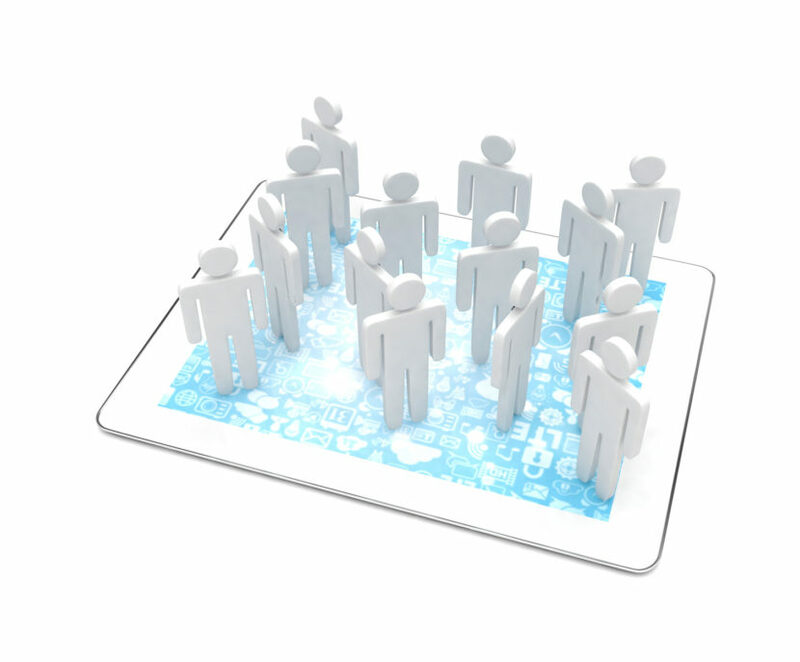 Teams offers a high degree of customization for its users. For example, team members can add different “channels” to group conversations, applications and activities into specific purposes, needs or intentions. The creation of a new channel cascades to the Groups’ side with the creation of a new parent-folder in the group’s document library – each channel, therefore, has its own “library”. All teams have one, mandatory “General” tab. Within a channel, different applications may be connected, such as a Notebook, Website, or Planner board. Like the addition of a new channel, the creation of a new notebook adds a new section to the group notebook, enabling the perception of multiple notebooks per team. At present, a team can connect to an existing Group, though not without complications. To move an existing group’s DocLib content, the user must put it under “General” folder, which Teams reads as a new channel. All subsequent “channel folders” must be created from the Teams’ side. The creation of multiple DocLib apps in the Group’s site do not relate in any way to Teams. Additionally, one cannot move content from existing Groups notebook into Teams. At. All. Learning about Teams, our users are most excited by the expanding increase in an organic teaming capability across the Microsoft 365 platform. The potential enterprise-level security concerns may be managed both from an administrative and a policy angle. What was perceived as a bulky, clunky, megalithic capability is now functionally tailored to better support rapid innovation within start-ups, small businesses and established enterprises alike. What more, the embellishment of Groups with a messaging capability offers a more native communication tool to millennial users preferring digital collaboration. As tech nerds, we are excited by the potential of the embedded-AI for text mining of internal dialogue, which enterprises can leverage for increasing awareness and understanding of user concerns. Do you have more suggestions? Post them to #GroupsVsTeams. Answering the question of “what to use, when?” in O365-reliant organisations, we next propose a communication and collaboration strategy from a small-business perspective in Part 3.